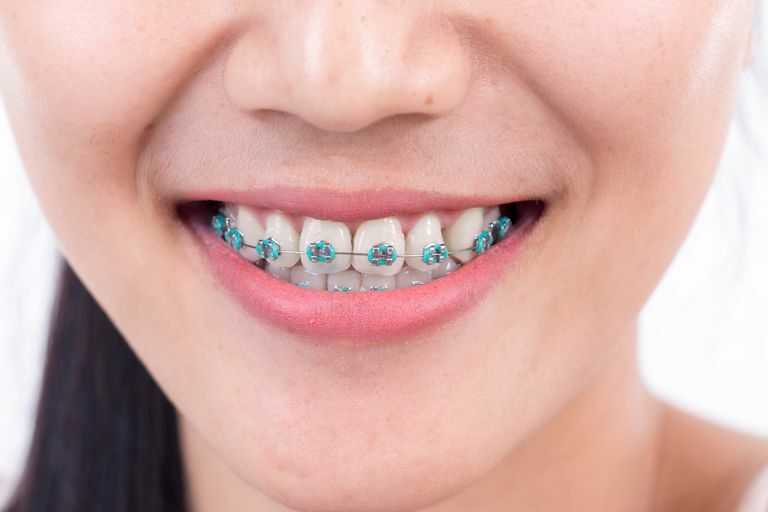 Rubber bands on braces – the elastics that surround each bracket – are just one of many different parts and pieces your orthodontist will adjust during your check-ups. The small rubber or metal elastics, more commonly called "rubber bands," that surround your braces are technically called elastic ligatures. A ligature is used primarily to keep the archwire held into the slot on the bracket but they can also direct the teeth in a particular direction, depending on the type of ligature used and how it is tied onto the tooth. Single elastic ligatures come in a variety of colors but their size is usually uniform. Your orthodontist will change your elastics at every appointment because this type of ligature loses strength over time. Depending on how the elastic is tied onto the tooth, a varying degree of force can be applied to the teeth, effecting a greater or lesser degree of adjustment to the structure of your teeth. Connected elastic ligatures – also known as power chain or c-cloohain ligatures – come in a variety of colors and strengths. Connected elastic ligatures are used by your orthodontist to close spaces between the teeth, or move specific groups of teeth together at the same time. Connected elastic ligatures may be changed at each appointment. Stainless steel wire ligatures are used in the same way as their elastic counterparts but they offer substantially more force between the bracket and the tooth. When your orthodontist straightens a tooth that may be twisted or turned, the archwire must remain securely in the slot of the bracket. A wire ligature is therefore often the preferred choice of ligature because it allows the orthodontist to keep the metal archwire securely tied into the bracket slot. Your orthodontist may let you select the color of your elastics. Choosing from a rainbow of colors may make kids happy, but adults may want to select something a little more discreet, so you may be given the choice between silver or clear elastics. If you sport metal (silver) braces, the best choice of color is selecting a corresponding silver or gray color. It's reasonable to think that a clear elastic would remain the most discreet but those elastics retain some of the natural stains that are common with drinking coffee, tea, or soda, as well as darker pigmented foods. In very little time, the clear elastic will become stained and appear dark and discolored. Grey or silver elastics blend in well with the metal braces and generally don't stain like clear elastics do. Did an elastic become loose, break, or pop off between orthodontist visits? Call the office. You might be able to get away until your next scheduled appointment, but let your oral health professional decide. A break of just a few elastics could adversely affect the carefully choreographed changes to your teeth and jawline necessary to give you a bright, perfect smile. Alberta Society of Orthodontists. What Do Elastics Do? American Dental Association. Braces and Orthodontics - Frequently Asked Questions. What Are Braces Made From? ArchWired. What Are Power Chains?